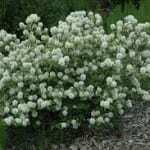 Compact slow-growing shrub. Dense mound. White filaments with yellowish antlers.